Requiring a humus rich soil, Uvularia are an excellent plant for a lightly shaded position. Attractive flowers followed by good foliage that holds well into summer they make a colourful addition to the garden. We think they are an elegant plant, they do need some moisture over summer, however are well worth the effort. They are a plant that grows from rhizomes and require similar conditions to Polygonatum and Convallaria. Bees and insect love the flowers and they are a brilliant yellow. The slightly twisted foliage adds another level of interest. These small bulbs are originally from America. Flowering in spring they are also known as Bellworts Fairybells or Merrybells. 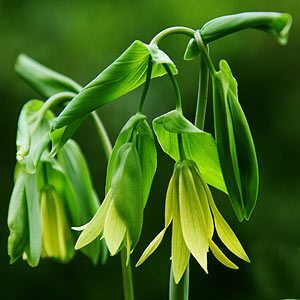 Uvularia are a woodland species and are especially suited for growing in the shade garden. A low growing perennial to around .3m Uvularia grandiflora has pretty nodding yellow flowers in spring, an excellent plant for a woodland situation.